Camilla Larsen has been awarded a prestigious New Investigator Award by the Biotechnology and Biological Sciences Research Council (BBSRC). These highly competitive awards support talented early-career researchers seeking to secure their first major element of research funding. A major challenge in neuroscience is to understand how the brain transforms sensory stimuli into an appropriate behavioural response. To address this question Dr Larsen is studying chemotaxis in the fruit fly. Chemotaxis describes a behaviour that is common to all animals and involves navigating an odour gradient to find food, avoid predators and locate potential mates. In order for an animal to successfully chemotax the brain must measure the changes in odour concentrations in space and time as the animal travels through an odour plume, which form as the wind disperses odor molecules from their source. These changes must then be translated by the brain into a sequence of motor commands that direct movement toward or away from the odour source. Although we have a good understanding of how the brain detects and categorises different odours, it is unknown how odour recognition and changes on odour concentration are transformed into goal-directed behaviour. The aim of this BBSRC grant is, for the next three years, to exploit the experimental accessibility and well described neuroanatomy of the fly brain to describe the connectivity and functional properties of the circuits and cell types that transform odour stimuli into motor output. 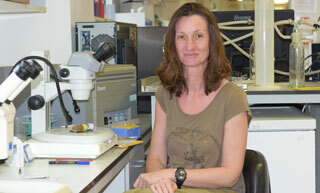 Camilla Larsen has previously received a Wellcome Trust Career Re-entry Fellowship in 2008. To find out more about BBSRC New Investigator Awards, visit their website.